Brining is an age old tradition that brings meat to a new level of juiciness and flavor. Originally used as a way to preserve meats, the process is continued to be used as a way to aid the flavor and texture of meat. It is basically a salt and spice bath for meat. If you have ever wondered how to brine meat, there are a couple of ways to go about it. This article will break down some base ways to get it going. That way you can take the idea and run with it, creating your own masterpieces based on spices and a scientific process of osmosis. If you want a juicier, more flavorful and tenderer piece of meat, the one ingredient that will improve all three is salt. So what does brining do to meat? Brining relies on osmosis to draw extra liquid into the meat. Water wants to move from areas of high concentration to low concentration. Because of this, the water is drawn into the meat. The absorption of the water also brings in whatever spices you have added. The combination of spices adds extra flavor, and the water makes the meat stay juicy. 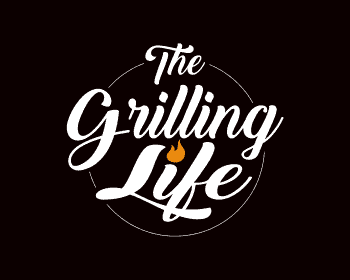 While grilling or cooking, the meat will lose about the same amount of water as it would without a brine, so the meat ends up with more water and juice within it. If you don’t want to soak your meat in water, you can brine it dry as well. Wait… but what is dry brining? Dry brining is a similar process as dry brining, but lacking the water. You spice the meat very well, put it in a plastic bag or something similar, and let it sit for a day or two (or however long is needed). What Meat Should Be Brined? 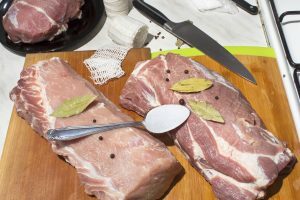 When looking at how to brine meat, there are some alterations to keep in mind for different meat types. The basic reasoning for brining is to keep the meat juicy while adding some extra spices. With that in mind, the types of meats that can see a drastic improvement are types that don’t normally have a juicy texture otherwise. Extra fat in a cut of meat will give it extra juice, and keep it moister after cooking. Hence ribeye’s are known for being so succulent. Therefore, meats with lower levels of fat are great meats to brine. Poultry is one example of a good meat to brine. A full turkey or chicken can take a long time to cook and can lose its moisture in the process. Brining is a great way to keep extra moisture locked into the bird. Big pieces of meat, like pork shoulder or pork roasts, are another awesome type of meat to brine. The thick chunks of meat can take a bit longer to fully season though, so keep that in mind when you are planning to cook it. The process is simple but elegant. It gives the ability to personalize, and expertly craft your own recipes. Start with a container that will easily hold whatever meat you are planning to brine. Add one cup of salt for every gallon of water you use, making sure it is enough to completely submerge the meat in. A sure way to dissolve all the salt in the water is to boil the water, or at least part of it while adding the salt in. Before setting your meat in though, let the water sit. The water should be cool or room temperature. It should not be hot, you don’t want the water to start cooking your meat before you’re ready. A trick of the trade is to check the water solubility by putting a raw egg in the water. If it floats, there is enough salt. Also, add whatever seasons you want to be infused in your meat. This is based on preference and can be changed depending on what style of cooking you are going for. Place your meat in the water. Some meats will float in the water, forcing you to place something over the top of it so it will stay completely submerged. The key is to have the meat surrounded by the water and covered on all sides. This way it will soak in as much delicious flavor as possible. Once everything is in the water and ready to soak, cover the container and place it in your fridge. Nobody wants extra bacteria in their food. By covering and refrigerating the meat, you are helping keep bacteria out. Brine lengths of time depend on the size and type of meat. For larger, denser meats, you will need to soak longer in order for them to fully infuse with the seasoning. It is possible to over-soak your meat, but much less likely than under-soaking it. Be sure to keep it reasonable though. A basic rule of thumb is to soak the meat for about one hour per pound of meat. This is if you are soaking a single piece, of course. There are also some other base soak times for different meats, depending on their density. Since these meats are so much less dense, they will need less time soaking. A whole chicken can follow the “hour-per-pound” rule. Shrimp won’t need more than an hour to soak, no matter the amount. Since they are all separate pieces, it will completely infuse in a short amount of time. Any pork loin or shoulder should be soaked for at least 12 hours. The density of the meat plays a significant role here, so allowing ample time for the brine to work its magic is crucial. A quick brine is not very helpful, I wouldn’t bother if I were running late in the day and hadn’t started the pork brining before going to work. Feel free to leave the meat in for 150% of what you initially calculate. That amount of time won’t hurt your meat and will add that extra flavor throughout the meat. You can also read more on the ins and outs of wet brining by reading What Is Wet Brining? A Grillers Guide To The Benefits Of Wet Brining. Dry brining relies on no water, and more time to soak in the spice mixture. Since the meat isn’t surrounded by water, it can’t rely on the osmosis of the meats liquid to draw in the spices. Instead, it sits longer in the spices, allowing it to absorb the flavors slower, but still thoroughly if done correctly. Start with about one tsp for every two pounds of meat, then add any other spices you want to a mixture. Rub the mixture vigorously on the meat, completely covering it. Once you have ground the spices into the entire surface, put the meat in a plastic bag (like Ziploc). Let it sit for at least a full day. Since it isn’t sitting in water, the meat won’t get ruined so easily by over-brining. It is more a worry to still cook the meat while it is fresh. Don’t leave it for weeks… because that’s gross. Anything more than three days and you are entering the zone of serious food safety issues. Another method for dry brining or “deep seasoning” is to leave the meat uncovered in your refrigerator for one to three days. After adding your salt mixture, place it on a wire rack over a foil-lined tray in your fridge. This is my preferred method. For more on that, check out A Grillers Guide To Salting Your Steak. You can also read more on the ins and outs of dry brining by reading How Does Dry Brining Work – A Grillers Guide To Dry Brining. Now that you have a base understanding of wet and dry brining, here is a great way to finish off your meat on the grill by using the reverse sear method. How to brine meat depends on the size and type of meat, also on your personal preferences. Whether you like super spicy, outlandishly flavorful; wet, or dry brining; brining is a great practice to bring into your kitchen. The food will speak for yourself, so give it a try and let us know how it goes! As always, if you or someone you know find this information on How To Brine Meat; please consider sharing it with your Grilling friends and on social media! If you would like to leave a comment or have useful tips of your own to share on how to brine meat, please do so below. We always welcome your input.